The Spokane Public Market has publicly announced that the market will close it's doors at the end of the day, next Friday, March 7th. 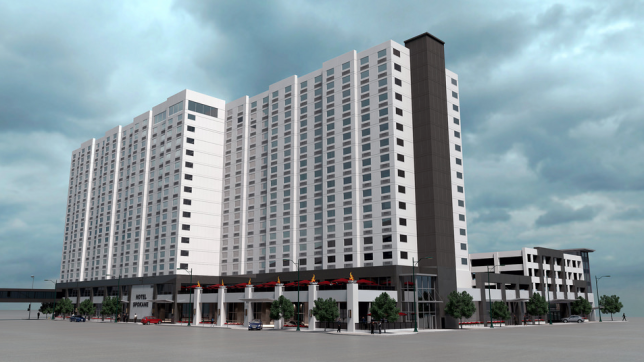 The newest version of the rendering of the planned hotel, going up now in Downtown Spokane across Spokane Falls Blvd. from the Convention Center and INB Performing Arts Center. The Big Dipper making plans for restoration , re-opening . Just a couple of weeks ago or so , we made mention the re-opening of The Big Dipper on this blog. The business has re-opened and is now being used as a event center for smaller events and gatherings. But as many know, The Big Dipper , was originally a live music hub for Spokane. And, shortly after announcing it's opening for events. Plans have come up for renovations that would bring the business back as live music venue. The going out of business sales are due to begin this week at the only Office Depot location in Coeur d' Alene. Two big local names in events and catering have teamed up again and opened a new event & meeting facility in Spokane Valley, which is cleverly named Spokane Valley Event Center. The City of Liberty Lake seems like the perfect spot for a gourmet meat market , so it's only it's only fitting to report on the opening of just such a business in the growing Inland Northwest town. Usually an expansion of a Hawaii based chain of coffee roasters & retailers wouldn't make the Inland Northwest Business Watch page, although it would be good news. But in this case it is news for this site, because that business, Maui Coffee Roasters has chosen to open their first mainland location right here in the Inland Northwest. JAVA on Sherman to relocate & expand. Coeur d' Alene and North Idaho is now home to more coffee shops and stands then I could ever count. But it all , in a way, started back in mid 1990's with the opening of Java on Sherman , considered to be the first coffee shop in the area. Since the 90's Java has become a landmark and the go to coffee shop for really all of the Inland Northwest. And, while Java on Sherman isn't closing, some very big changes are in store for the iconic local business. The list of Spokane area sporting goods stores will soon grow by one. And this one is new to the Spokane market , but should be a easy to recognize because they've been here before. Rumor Mill: Is Rosauers Supermarkets opening a store in Suncrest? Living on the opposite side of the Spokane Metro Area, I hadn't heard of this rumor until just recently. But as it turns out there may be some truth to the rumor of a Rosauers coming to the Suncrest area just Northwest of Spokane. I must admit, with all the " bikini barista " coffee stands that have popped up all over Spokane & Coeur d' Alene , I'm surprised this business concept hasn't been tried yet. But it hasn't, until now. Citing a Spokane has a under served market for reproductive medicine Seattle based Seattle Reproductive Medicine recently opened their 5th location and their 1st ever location in the Spokane market. The signs are up and the name has officially been changed, but fans of Aslin Finch need not worry because that is about all that has changed. In early 2013 Aslin Finch and their wholesale division AFCO Distribution & Milling we're sold to a Western Washington based company called Skagit Farmers Supply. Before starting today's new business highlights, I must ask something of the readers of the Inland Northwest Business Watch blog & Hot Off The Blog column for your help. Most likely because of the winter season there seems to be a bit of a lull in new businesses to report on. Aebleskivers may not be an the easiest name to pronounce but it is a name everyone will surely soon be hearing more and more as the business is planning to open their first ever full time location in Coeur d' Alene's Silver Lake Mall. Exciting news: The second Buffalo Wild Wings location in the Inland Northwest will be coming to Coeur d' Alene in the near future. While we don't have an official word from either the restaurant chain or the land owner / developer , I do have enough info to be confident that Buffalo Wild Wings will be coming. Once the home of two long time Spokane business, two adjoining Downtown buildings have both been sold ( in two separate transactions, but to the same owner's ) and will be renovated for new retail / restaurant / ? uses. Those two buildings are the former Huppin's at 421 W. Main and the former Dutch's music store directly east of the Huppin's.